This dish is fantastic! Definitely tastes like something you would get at a restaurant. The best part…it’s quick and easy. Certainly company worthy. Recipe is adapted from a recipe in the June 2010 issue of Cooking Light. Combine 2 tsp. olive oil, salt, cumin chile powder, and pepper; rub evenly over steak. Heat grill; grill steak until done. Brush polenta with 1 tsp. olive oil. Sprinkle with salt. Place a piece of foil on the grill and add the polenta; cook 3 minutes on each side or until browned. 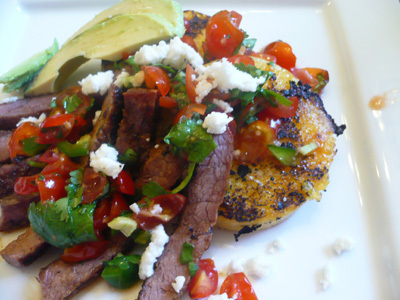 Arrange sliced polenta on a plate; add steak, top with pico, queso fresco, and avocado; then squirt with lime.